The photo above is one of the before shots from the first episode, "Trying Tuscan." Jaime & Sandra love their new home and were trying to warm it up, add some vibrant color and create a place to gather. When they posted their before pics on RMS they got 2.5 stars. They were in need of a little help to get them off the ground and closer to a 5 star transformation. They found some really cool inspiration rooms on the RMS site and wanted them as a jumping off point for their own home. They even got to video conference with their fireplace inspiration, HOW COOL IS THAT? 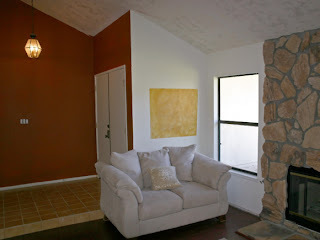 This transformation was less about a theme and more about a feeling the homeowner's wanted.....So, we picked up the tab on this makeover to give Jaime & Sandra a place to relax and be inspired in. This was the first episode we shot back in October '07 and we all were excited, nervous and thrilled to be a part of this unique concept of interactive design with the RMS on line community. -many other accessories were bought at local antique stores. Check out the show and tell me what you think? Look for us on our regular time slot, THURSDAYS 9/8c. Who knows...I may be coming to your house next! Congrats on the new show. It was so exciting to watch it. I have been telling all my friends about it. I loved the tuscan design, you are amazing as always. Best of luck and much success. I will be looking forward to each episode and watching faithfully. Angelo, That show got me so excited about redesigning my dining room. I love the draperies. Would you please tell me where I can get them? Thanks so much. Loved Sunday's show. Tuscan design is so beautiful. Could you please tell me where I can purchase the draperies? Can't wait for Thursday night's show. Love the show! My hubby is still sighing...not only is he a RMS website widower (figuratively), now I'll steal his remote control each Thursday! LOL! Informationally, did you know that the Mariposa490 (whose room/lamp you just featured on your spacecast) is the bloginista "Visual Vamp"? The show aired over more than a year ago and it is still great. This episode might have been your first but it set the tone for something amazing. You are awesome and so is your vision of design. Now all I need to do is figure out how to get those burnt orange chairs and you are in business. Call me when you are ready to come to WA.